I’m not a huge fan of Silverstone as a spectator. The distance between where you can stand and the bikes on track is huge, F1 run off means acres of kitty litter pretty much everywhere. It’s just a bit, dull. I’m not talking about the racing being dull, it’s a mega circuit to ride and usually provides some fantastic racing when MotoGP comes to town. But after years of sitting in press offices at circuits all over the world to cover racing, I find it easier to cover now from the comfort of my MacBook, TV and sofa at home. One thing that you never get when you’re sat at home is that rumble in your tummy when the leading pack blast past. You also miss out on the smell and heat that race bikes produce. Don’t worry, I’m not about to get fluffy and emotional about it all, but it’s a fact. Race bikes smell nice and no surround sound system in the world can touch that feeling when a top rider gives a factory bike a kicking in front of your very eyes and ears. I was planning on taking the Silverstone round of MotoGP in from home this year, Twitter, Facebook and web updates just come easier to me from the comfort of a Corona in a corner at home. Then I got an email about the RD Pro-Am race. 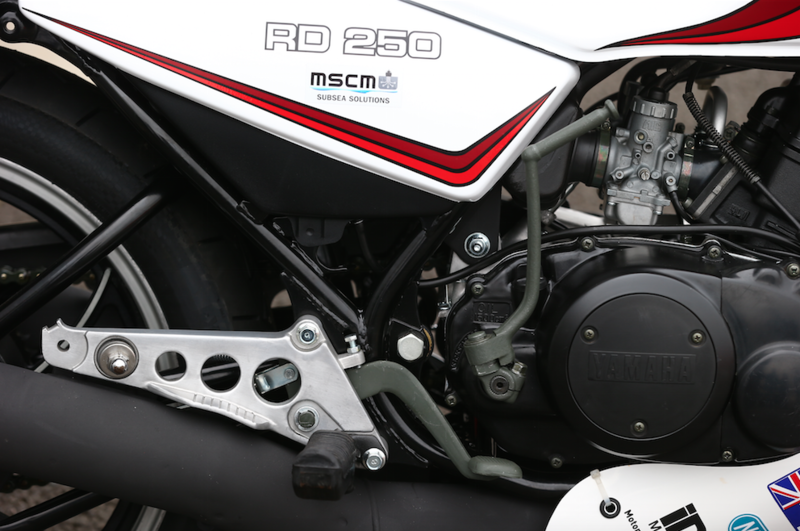 In short, there’ll be a support race of around 25 identical Yamaha RD250LCs, ridden by the guys that raced the 350 versions back in the early eighties. I was only three years old when the original series was in full flight, I didn’t grow up pulling wheelies on 350LCs in jeans and trainers like a lot of my friends did. More’s the pity. There’s no way I’ll pass over the opportunity to go and see what this fleet of two stroke proddie racers will do to my senses next month. I also couldn’t pass over the opportunity to shoot up to Silverstone a few days ago for a mini media day, organised by Bennetts insurance, who are sponsoring the event. I arrived to see a mint looking RD250LC, a smiling Niall Mackenzie and a timetable with available slots for podgy journalists to throw a leg and have a wobble round Stowe, on one of the bikes that will next month be flogged to within a millimetre of its life by the likes of Niall Mackenzie, Damon Hill and a bunch of other ‘older’ children that refuse to give in to golf clubs and comfortable slippers. Check out the interview with Niall below, then check out one of the original races in the window below that. We’ve included some images of the bikes as well. We’re not going to talk about the bikes too much as we have a video interview with Daryl Young from IDP Moto to feed you next week. 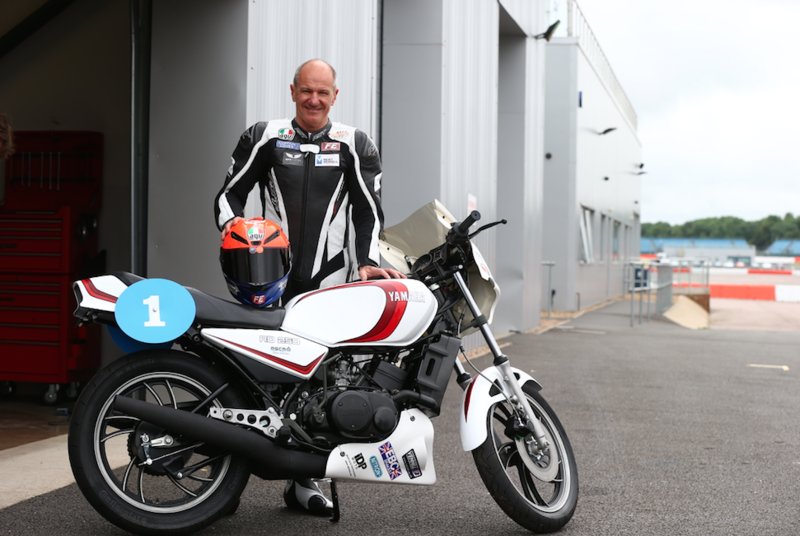 He’s the guy that was tasked with finding the bikes and building them to exactly the same spec for the races (plural, there are plans to run this for the next few years). 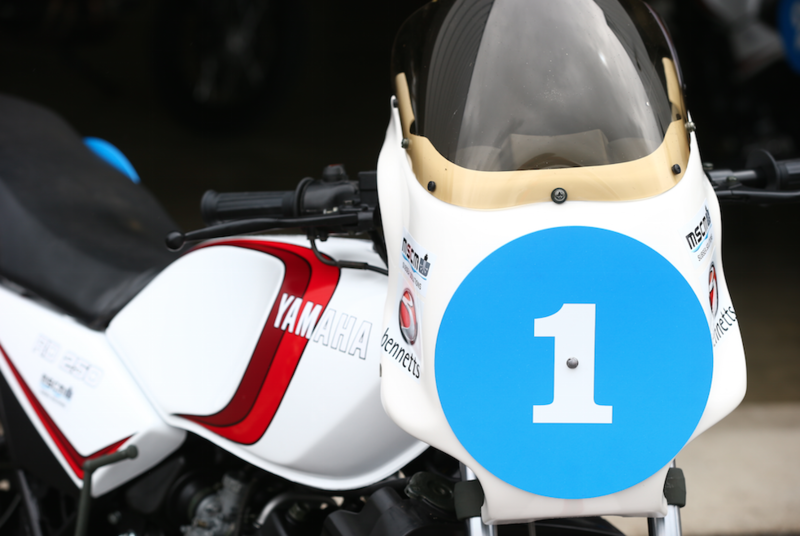 Sit back, take in what you will, but know that you’ll be much better off getting along to Silverstone to see and smell these little beauties in the flesh to really appreciate them. For the purists that are wondering, 350 parts are far too expensive now to put together a fleet for racing, hence the 250s rather than the larger versions as per the original series. Follow Niall on Twitter here. Check out IDP Moto here and buy MotoGP tickets here.